All set and ready to play...the tools...the glue...and bits and pieces. If you were here last week and wondered what I'd do with the remote parts...you can view the previous post. I'm going snooping...I've gotta see what my friends are up to. Thanks to my followers new and long term and thanks for stopping by...leave a comment and I'll return the visit. Lots of treasures in those drawers. Have fun creating. Creativity just waiting to happen!! Love all your tags in your last post. I think there are some OLD remotes still around here, I'll have to see if I can find them and take them apart. Great idea BTW. In am with Eliza! After reading your last post... I bet I would find some really awesome bits and pieces in your studio! Awesome and very tidy space!! Lots of goodies! Looks like you're ready to work! 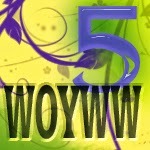 Happy WOYWW and thanks for visiting! Love all your neatly organized stuff. That wedding silhouette is especially beautiful. I have some of those plastic bins but they have been moved to my storage unit downtown. I just had a shelving unit set up on my little patio out back and plan to slowly move stuff from the storage unit back to my house. They are so useful, aren't they! You have lots of fun stuff on your desk. You're so organized! I WILL get there! Thank you for your visit! My working space ....? well its usually where I can push back and get a card in that space!....a little to the left of the jars! Your desk looks very organised!! Wow! I wish my studio was as nicely organized as yours. Blessings! You seem to have organised your space beautifully. I like the interesting bits and pieces on your little shelf. Lovely dancing couple in the black and white card - lots of goodies to play with too. you have lots of lovely crafting stash on show for us today and I know that a number of us would be round in a flash to play if we could. Ooh talk about a staged desk lol!! Lots of lovely goodies ready to play but also very tidy and orderly too. My desk is normally pretty tidy, I can't create much in clutter, I think it clutters my mind too! Thanks for stopping by. So many goodies and so neatly organised, that would be a great place to craft. Further to you comment on my post - I did reply and have sent another one to you, both privately to the contact address on your profile. I am sorry if I have caused you any upset, I would never do this. I am most grateful for my prize, which is really appreciated, and I still feel honoured to have won it. I didn't come out to play last week but your post caught my eye so I had to go check it out. I do like it when folks show more than their craft desk. All the other storage, spaces, and places are just as interesting to me (says the gal who never thinks to photograph them herself).